Ever catch yourself reading a book or news article that rattles your emotions—making you laugh out loud or downright upset? Well, you have the power of words to thank for that. But, as an entrepreneur, writing persuasive sales copy goes way beyond a concoction of powerful words and phrases. It’s about telling a story while using special vocabulary that triggers a reaction among your people. And, that’s what we’re covering today—the four copywriting techniques you need to implement to stir up more emotions among your readers throughout all your sales content. These techniques actually have the power to get them to convert because, after all, people buy based on their emotions—not the product or service itself. So, consider these techniques to be an opportunity to learn how to give them a polite, virtual kick in the rear to persuade them to purchase your product or service. If your product or service is super technical, injecting emotion into your copy can be a daunting task. Maybe even an impossible one, in your opinion. Is that the thought that’s coming to mind right about now? Well, we’ve got just the solution—something that’ll take the time-consuming task of copywriting off your desk completely and craft conversion-worthy copy for you. Stay put until the very end of this article because you won’t want to miss out on learning about this special tool! There’s one requirement we must tackle in order to truly connect with your readers: you must have a solid understanding of who they are and what they’re experiencing. Meaning, what’s their state of mind? Where are their emotions being aimed? Why are they experiencing these emotions? What trigger words best match their feelings and vocabulary? When you answer these questions to the best of your ability, you’ll be able to successfully exploit their emotions (in a respectful way, of course). The more you know about your customers, the more you can provide to them information that is increasingly useful, relevant, and persuasive. Yet, if you find yourself struggling to even attempt to figure out who your ideal reader is (and even what language they use), head on over to this blog post we put together to get you on the right track. Seriously… because this is important! There’s no one-size-fits-all solution. Thus, it’s absolutely critical that you know your ideal customer from head to toe in order to be able to speak their language and appeal to them. Once you do, come back to this post and get ready to amp up some emotions in your sales copy. 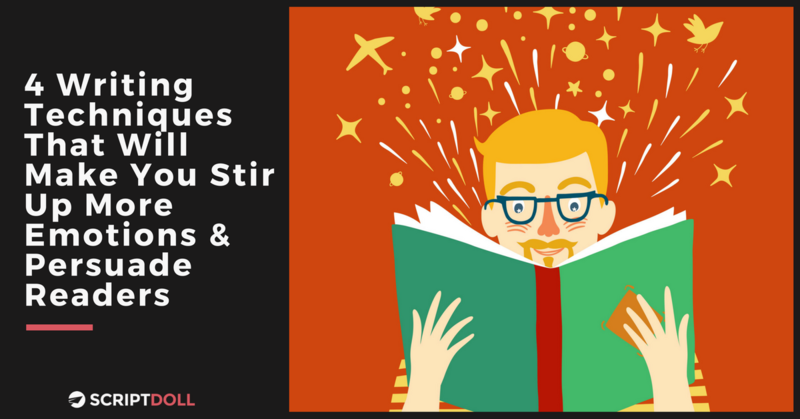 Now, it’s time to introduce you to 4 copy techniques that will make you stir up more emotions & persuade readers! Although these four emotions can spawn other emotions, focusing on this whittled-down list will definitely assist you in knocking on the right doors of your audience’s feelings. So, let’s dig into how these shape the four copywriting techniques we’re sharing here today to elicit a reaction out of your readers. 1. Use your audience’s biggest headaches to create frustration. Now, I’m not saying to go all Game of Thrones on them and break down their dignity. You know, treating them like Cersei Lannister. But, you do want to work them up enough to where you’re putting their biggest headaches they’ve been trying to solve at front and center. I mean, clearly, they’re so annoyed with what it is they’re currently doing/experiencing that they’re ready for a change. That’s obvious, or else they wouldn’t have made it to your site. So, go ahead and kick off your content with the feeling of frustration. For example, using a phrase like: “Aren’t you fed up with _______?” For example, is your target mostly fed up with the lack of time they have to dedicate towards what they truly love to do in their biz? Then call attention to that. And, it’s perfectly okay to balance out the scales by sprinkling in empathy, letting them understand you know what it is they’re going through. Once you do, you’ll be ready to move onto less aggressive emotions to position yourself as someone who can help them. Trigger words and phrases to drizzle into your copy. Remember, however, these 100% depend on the feelings you want to elicit and the language your audience uses. Sample trigger words/phrases: failure, lazy, humiliation, guilty, unfair, dread, frustrated, had enough, never again, temporary fix, sick and tired, hate* (we recommend you use this one sparingly). 2. Use your personal story to create sadness (and, in turn, build inspiration). You obviously created your product or service because you felt there was a need for it. And, you most likely were in the same shoes your audience is currently in. Therefore, this is the time for you to prove you understand exactly where your audience is coming from and their feelings of frustration at this point in time. Again, you’re building that connection with your people! For example, maybe you’re a chiropractor and you grew up seeing your mother in a tremendous amount of back pain. It was obvious that it affected her ability to enjoy everyday activities with you and your siblings. So, you went to school and opened your very own chiropractic practice to help others feel relief from their discomfort and be able to be there for their children once again. Talk about an inspiring story! See how a simple, heartfelt message can build a bridge between the business owner and the prospective customer’s experiences? Sample trigger words/phrases: doubtful, uncertain, unsure, helpless, impatient, questioning, wondering, searching, eager. 3. Use your product/service details to create happiness. Okay, you’ve pointed out your audience’s biggest struggles, headaches, and ultimately, what keeps them up at night. And, you’ve also told your personal story to serve as evidence that you were once in their shoes. Now, it’s your chance to bring in the big guns—your product or service details—to create some much-needed happiness! It’s the answer they’ve been searching for, and you’ve kept them waiting long enough. Don’t you agree? If so, go ahead and share exactly how your product or service will provide them with relief. Will it save them time? Money? Free them from fear, worry, or stress? Whatever it is, put it in the spotlight to help them paint a happier future with your offering. Sample trigger words/phrases: undo, overcome, empower, destiny, boost, cure, energize, vibrant, guaranteed, freedom, assured, fulfilled, at ease, conquer. 4. Use FOMO (or scarcity) to create fear. Think you’re about to have to scare your readers away from purchasing? Think again. Instead, you’ll be focused on using scarcity to create the fear of missing out (FOMO). This’ll get them right where you want them, pushing them to grab hold of what it is you have to offer. That’s because fear is governed by the amygdala. It’s the part of our brain responsible for the fight-or-flight response that occurs when something is deemed a threat. As a result, if your reader feels they could be doomed to not achieve the same results you achieved (which you shared during your personal story in the last technique, right?! ), they’ll act fast. Limit the time on the offer—add a deadline to the offer, which tells the reader the price or product will be changing after time’s up. Limit the quantity—whether it’s a finite number of stock available, or a limited number of spots, back it up with proof. For example, you only have 10 spots available for a free teeth whitening session at your dental practice. Or limit the offer as it stands—how you do this is by limiting other elements of the offer, such as: the extras (free support, free installation, free shipping, etc. ), the price (perhaps there’s a looming price increase to cover costs of extra customers), and so on. No matter what you choose to do when it comes to injecting FOMO with a sense of urgency into your copy, chances are, you’ll see some results. No one wants to be the odd man or woman out of a great offer! Sample trigger words/phrases: deadline, limited, alone, worry, quick, before you forget, while it’s fresh in your mind, missing out, left behind. Does the task of writing copy that connects with your audience on an emotional level seem nearly impossible? I get it. I was once in your shoes. That was, until I found the key to unlocking my biggest headaches. Meet your new copywriting companion: ScriptDoll. Frees up your time to put focus towards more productive tasks—simply complete your product portfolio, answer a handful of painless questions regarding your product details, bonuses, and more, and ScriptDoll turns your answers into engaging copy in a matter of minutes. Decreases your workload to almost nothing with pre-made product profiles—are you a puppy trainer, dentist, plastic surgeon or graphic designer? If so, you’re in luck because your product profile has already been completed for you. There are many more waiting to be used within the software engine. It’ll be that much easier to push out content that converts. Grab Hold of Your Conversion-Worthy Copy Now—Join ScriptDoll! You see, sales copy doesn’t have to be boring and pushy mumbo jumbo. In fact, when you put the four copywriting techniques shared here today to good use, you’ll be stirring up the emotions of your readers in no time. And, now, you hold all the power. Are you ready to serve up some seriously persuasive copy that sells? I bet you’re nodding that brilliant head of yours. Go ahead and join entrepreneurs like you who are raving about ScriptDoll—you’re just a click away. We want to know—how do you speak with emotion in your sales copy? Share your insight in the comments section below.